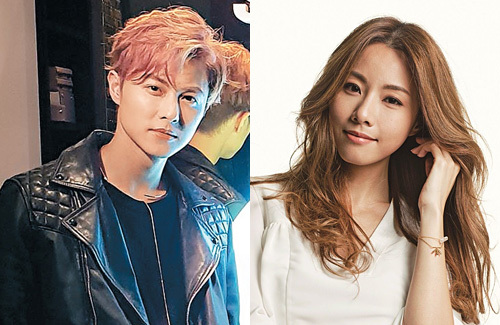 Things are heating up quickly between 34-year-old Stephy Tang (鄧麗欣) and 29-year-old Taiwanese artiste, Prince Chiu (邱勝翊). While the couple only publicly admitted to their romance this week, they have been allegedly dating since April. Prince is currently in Hong Kong and will be spending the next 10 days at Stephy’s home. Stephy and Prince’s romance first came to light because they were spotted at an airport flying to Thailand together. Since then, Stephy is either flying to Taiwan to see Prince, or he is going to Hong Kong to spend time with her. Last night, reporters saw Prince, who was dressed in a t-shirt and ripped jeans, arriving in Hong Kong. Stephy instructed her driver to pick up Prince and bring him back to her home. Since Prince’s next scheduled event is on July 28 in Taipei, he will have 10 days to cozy up with Stephy before going back to work. Some of the quotes from the brother Chris don’t make sense. Lost in translation perhaps?